Here are some simple steps you can take to improve your photos and capture the beauty of your designs. This article by beader and photographer Kirsten Creighton includes photo examples, additional photography tips, and a helpful summary chart for quick reference. 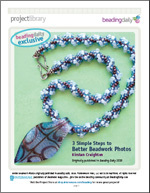 For more information on this topic, see the original blog post: "3 Steps to Better Beadwork Photos."